Think back to your last semester of high school… remember how painful it was to do any homework? During that last semester most of us had already been accepted to colleges, we figured as long as we didn’t fail our classes the grades didn’t matter to much. It was a long three months of struggling to get any work done. Well, it wont be the last time. During your senior year of college, you would think you would be doing all you can to finish off with the best GPA, and finish off with a lasting impression on your professors. You would think that if you don’t have a job by March you would be rushing around trying to find one.. right? I mean, none of us really want to go live back with our parents after four years of being on our own. Unfortunately, this is not the case. I don’t want to scare my readers but…. 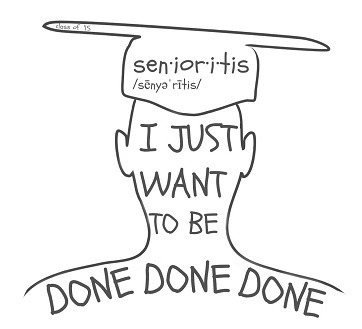 senioritis in college is ten times worse than senioritis in highschool. Except now, you have a lot more work that you are missing out on. Going to such a small school, the friends here have become family that I have made after four SHORT years. Believe me, I could stay here forever if it was just for the fun. But think about it, we are now in our 16th year of schooling. 16 years of having orders placed on us by professors, 16 years of feeling like our works not good enough, and 16 years of being over whelmed. We have gained a routine after 16 years. Go to school for nine months, get three off. Now, it’s ending. We will be working all day from nine to five (without our best friends). I think for a lot of us senioritis comes from knowing this is the last time it is acceptable to slack off even a little bit. I don’t encourage anyone to do it however, it is like a rotating cycle. First you slack off, then you stress out because your slacking off, and then you slack off some more. Tips on how to end this awful disease “senioirits”, are more than welcome.